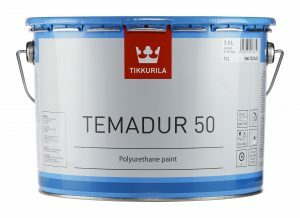 Temadur 50 is a durable 2-comp polyurethane top coat. The hardening urethane give a good wear resistance against chemicals and god color retention. Tintablet o most NCS and RAL colors. Together with Isotrol Primer and Isomastic the product make up The Isotrol Hybrid system. Rusty surfaces are primed with Isotrol Primer and new steel, or sandblasted surfaces, are primed with Isomastic. The simplification of cleaning pre-treatment lowers the total cost of maintenance in both short and long terms! The product require professional handling, knowledge and skill to be applied appropriately. Check your countries legislation’s for work or handling with allergen causing products. Technical and security datasheets should be read before usage.